New Gangsters are moving into your territory, operating on your turf, putting the squeeze on your family's interests. It's time to make your move. Hey, it's just business. It's nothing personal! 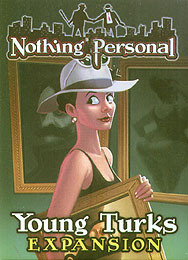 Young Turks is a 54 card expansion deck of Gangsters for the Nothing Personal board game, designed by Tom Vasel and Stephen Avery. Nothing Personal is required for play.